Brookwood RV and Family Campground is a fun and unique destination for the whole family. 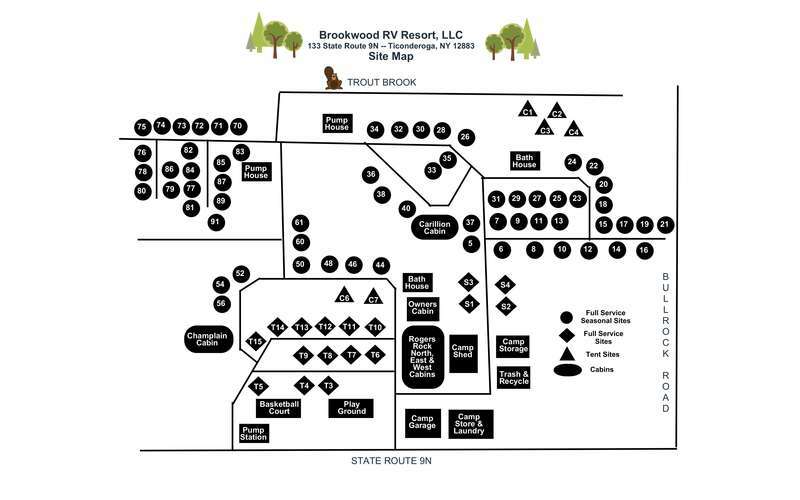 With our wooded full-service RV sites and modern but rustic cabins located in the northern Lake George region of the Adirondack Mountains, Brookwood brings back the meaning of family camping! Call 518-585-4462 to reserve your spot today! We stayed here every year for about 5 years. The staff is always super friendly and helpful. The male owner, not so much. Last year we called and said we were going to be late and due to unforeseen traffic we were 35 minutes later than we said we would be there. We had a site near the front and the owner would not allow us to pull into our space because it was too late (it was 9:35 pm). Kids were still out and people sitting around campfires. There were motorcycles going in and out but they made us stay in the front next to the busy road. My fiancé had a tournament the next morning and got little to no sleep as the street was super noisy and we needed to run our generator all night. Yes they still charged us for the evening. We are staying at Petros Millbrook this year. We have a 9:00 PM arrival policy just as many other campgrounds have also. This policy is out of respect for our campers who have already arrived at the campground. We have had many campers thankful for not being disturbed by vehicle lights and the noise of camper set up happening after 9:00 PM. Our policy is explained during the reservation process and reaffirmed via email. We always suggest leaving earlier on your trip knowing that there could be traffic or other issues during your travel.